Please join the Rotary Club of Grand Cayman and The Phoenix Group for our 3rd Annual Human Foosball Tournament. Funds raised will go to the Rotary Club of Grand Cayman to support its' many community projects. 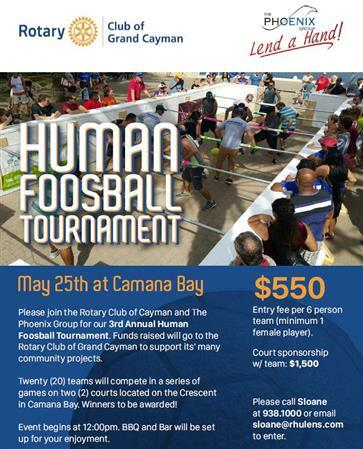 Twenty (20) teams will compete in a series of games on two (2) courts located on the Crescent in Camana Bay. Winners to be awarded! Event begins at 12:00pm. BBQ and Bar will be set up for your enjoyment. $550 Entry fee per 6 person team (minimum 1 female player). Please call Sloane at 938.1000 or email sloane@rhulens.com to enter.